King Clawdaddy is the boss of World 3 in the game Yoshi's New Island. 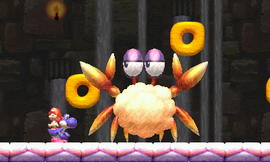 King Clawdaddy starts out as a normal Clawdaddy, but is then enlarged with Kamek's hammer. He attacks by walking around and rotating his claws and Yoshi must swallow all of the white substance hiding his body to make him vulnerable. Yoshi must now hit him with an egg to damage him and make him angry, the anger giving him faster attacks. He soon turns normal once again, and Yoshi must hit him two more times to defeat him. This page was last edited on February 7, 2019, at 01:18.